So when would you need to reseed? We’ll, lets say your active node blue screens. You fail over to the passive node, extremely limited interruption to your end users. Problem is, that blue screen, has corrupted your exchange DB on the active node. You can simply re-seed the working copy of your DB from the good node. We’ll simulate this now. Now, NYCCRNODE2 is no longer receiving updates. Let’s remove the files for the First Storage Group on NYCCRNODE2, simply delete them. You will need to stop the Exchange Services on NYCCRNODE2 to unlock the files. The green bar, is the copying of the database. Make sure you restart the Exchange Services you stopped earlier. Now check the copy status of the DB and it should read Healthy again. 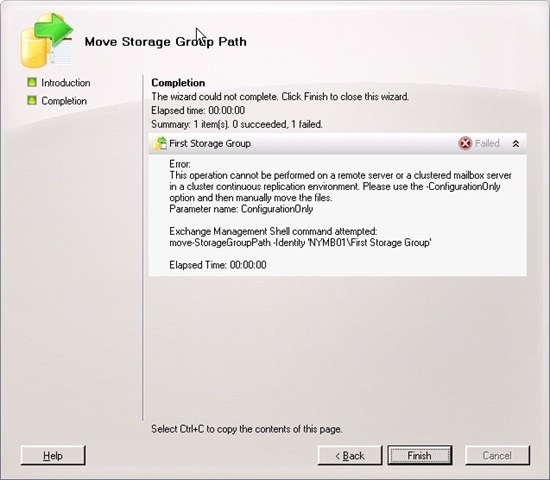 In SP1, you can also run the Suspend and Update commands by right clicking on the Storage Group in the EMC. Great! The cluster fails over without issue. If your end users are in Cached Mode, they wont even realize the cluster went offline! The error states you cannot perform this on a remote server (not us) or on a clustered mailbox server (us!) in a CCR environment. 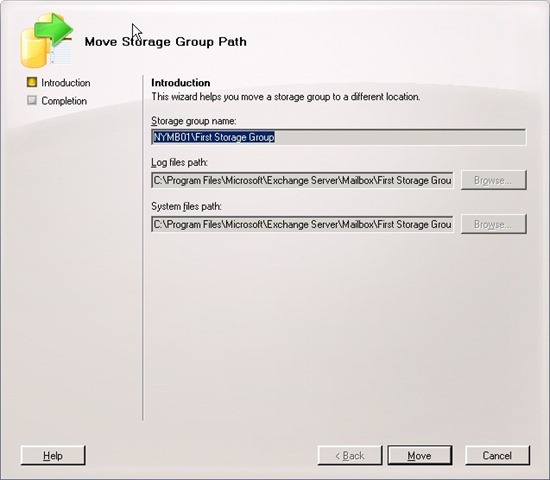 Please use the –ConfigurationOnly option and manually move the files. This is why the path’s for each node HAVE TO BE THE SAME! So, what are we to do? We follow the error’s suggestion. 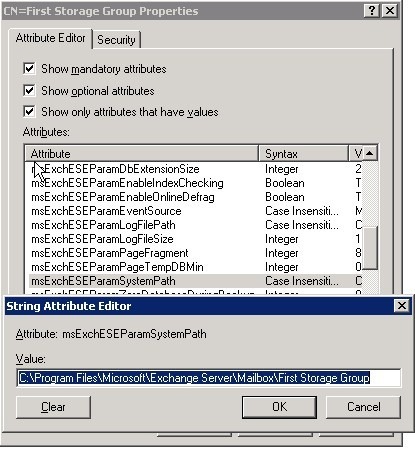 We use the –ConfigurationOnly parameter. What this will do, is update Active Directory with the new path we INTEND to have the files on. We will then have to move the files ourselves with good old fashion Copy and Paste. Just like all moves, this will cause the DB’s to be inaccessible. Unfortunately, having the cluster here doesn’t help as both will have to go offline. That is why it is better to do this upon the initial install, when there are no users on the server. The LogFilePath is the Transaction Logs, and the SystemFolderPath is the Checkpoint file. It’s been changed. 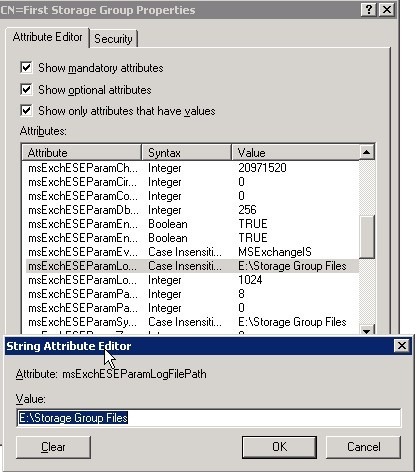 Now, do the same for the Exchange Database File. You have to move the EDB file PRIOR to running this command. That’s because you have to actually specify the file itself and the EMS checks this against the active node. Now, all the files are moved on BOTH nodes. We can re-mount, and resume seeding. And your files have now been moved successfully. As you can see there is a little bit more work with a CCR cluster than with other Mailbox Server role installs of 2007. Finish the above steps for any remaining DB’s and Storage Groups you have. This one is actually really easy when you think about it. Let’s say it’s Patch Tuesday, and you have a whole slew of patches for the Base OS, as well as Exchange 2007 to install. There is a certain process you should follow with a cluster. The process is simple. Always update the passive node. This means, install all your updates on the passive node, finish all the reboots, and ensure everything is working. Next, move the CMS over to the freshly updated node with the Move-ClusteredMailboxServer command. Now, update the node you just moved the CMS off of. Install all updates, finish the reboots, ensure everything is working. See, easy! Word of advice, make sure that each node is at the same patch level for OS and Exchange. So, it took us four articles to get there, but we are there. We have covered the theory behind a CCR cluster and how it can give an business the Enterprise level protection without a costly investment such as a SAN, to the installation of the cluster and Exchange 2007, to configuring and testing your cluster. Cycle for Survival!!! Donate to a Great Cause!